Make sure you check out my friends' blogs on the left here! Some of them post quite often. I just added Susan McDonald's Blog. She's a professional writer. So is Steve and some of the others. I also added my friend Ellen's blog. She's trying to start a new social media site for shy people. Please check it out! I went to bed pretty late last night and got up after 10:30 today, so I didn't take Brandy on the morning walk....I need to do better with that. I was sleepy all day. It was really hot out, too. I heated up the rest of the steak and potato in a frying pan, adding in an egg and more cheese. It was really good. Apparently it didn't make me sick, so that's good. I didn't do much most of the day, aside from watching TV and a little work on my site. Last night I was listening to music and decided to try to organize my singing music a little more. I got a copy of my iTunes play list that has all of my songs (all the ones I've recorded over the years). I edited it down to just the titles and printed it out. Today I went through my song pages to check off which ones I'd uploaded or not. I have over 800 songs recorded! Wow! Anyway, this way I can try to figure out which songs to record, or re-record, next. I called a few places...I called the pest control place about the spider, and they're sending the pest control guy, Michael, back here tomorrow. I called to find a vacuum repair place, and we're going to drop off the vacuum sometime this week. They don't charge to look at it, so that's cool. That's better than Sears! Hopefully they can fix it easily and it won't cost much. I also searched online for karaoke box places in San Diego, to plan our karaoke night with our friends when we visit at the end of the month. I found 4 or 5 to consider. I sent out an email to our friends, to let them know what dates we're considering. Hopefully they can all let me know so I can make reservations. Most of the karaoke box places are in Kearney Mesa. Later on, I felt better and took Brandy for her walk in the evening. 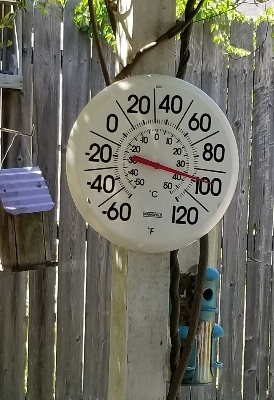 It was almost 100 during the day, so it was pretty hot. We really need some rain. There's a big ol' magnolia tree in the other cul-de-sac, and it doesn't look like it's doing well at all. It's losing lots of leaves and doesn't have a ton of flowers, and they're looking peaked. For a town called Magnolia, you don't see a lot of magnolia trees. I bought some fresh catfish Saturday at Brookshire's, so I cooked it up for David for dinner. Fresh catfish is hard to find here in the stores. They don't always have it at Brookshire's, and Wal-Mart and the other stores don't have it at all. I guess if you know someone who fishes, or you fish yourself, then it's easy. They used to have a fish store here, but it went out of business. Of course, you can buy it at Flying Burger, or the BBQ place, or other restaurants, but it's hard to find if you want to make it at home. They have this coating, Louisiana Fish Fry, that we used to use in Alabama. We couldn't remember for sure which flavor we used to use (there was only one that saw back then, and now there are like 7), and apparently we picked the wrong one because it was very different. I can't eat it, but cooking it up, it was very orange. He said it was so-so. Ah, well. I usually take a meat mallet and pound it thin, but this barely needed it as it was pretty thin already. I coat it in the seasoning. 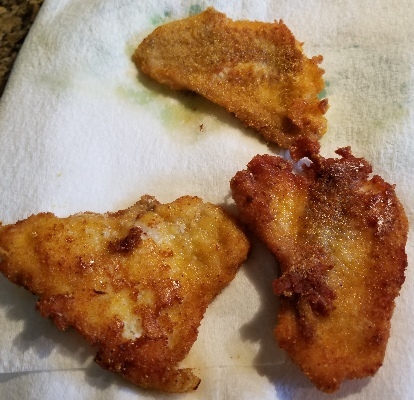 I heat up oil in a large frying pan on medium-high heat and cook the fish for about 6 minutes on each side (less if it looks done sooner), then drain it on paper towels. I had a bit more energy at night. I straightened up the house, gathered my pills for the week, finished the laundry, did more work on my site, etc. I stayed up until about 5am when David got up. There was no point in going earlier because I wasn't tired. Just like the previous day, I got up too late and was very tired all day. Nothing too interesting going on besides some work on my site, as usual. The pest control guy came by in the afternoon. He said the spider that laid all those babies was probably a Wolf spider, which is harmless. He said the stuff he was spraying probably wouldn't help much, but it wasn't an infestation, so it was probably OK. I tried to sing, but I wasn't feeling up to it. I was just too tired. I went to bed pretty early, around 10. I woke up at 9 with the alarm. I was still pretty tired all day. I walked Brandy. It was nice out. It got much hotter later. I had a short nap after that, too. 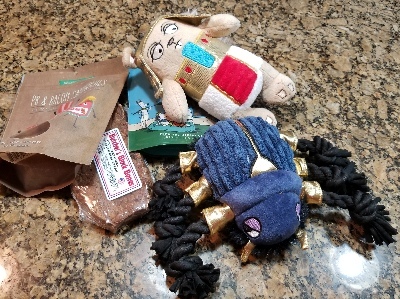 Brandy's Bark Box arrived today! She always loves getting a new toy and treats. 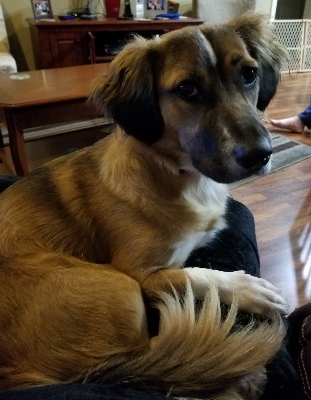 I'm supposed to train Brandy twice a day, but some days I only get one time done, so I'm going to continue "sit" through the weekend and see how we do. I was very sick again. Not sure if it was the Mexican place from Sunday that did it, or something else. SIGH. I had a phone interview with a scientist who works for Discovery Channel. I've been having bad luck lately with interviews. FOX rarely invites me any more. NBC and the other networks rarely have them at all. FOX finally did invite me for one on Monday, but I didn't realize you had to reply to a specific address, until it was too late, so I missed it. I hate when they do that. I just replied to the email as usual, and so they never sent me the dial-in information. It was super early in the morning, too. Then, ABC had one that I could have gone to, but I missed that one, too (didn't see it until it was too late). 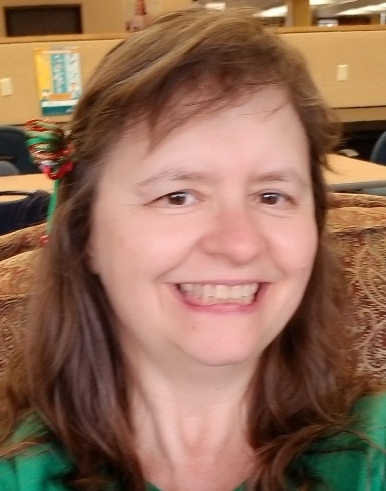 For today's call, I decided to try my phone app that I use for recording (I've used it many times for singing), rather than getting out my external recorder. Well, it didn't work. Turns out it only records my voice, not the person on the other end of the phone, even though they were on speaker phone. So annoying. Dummy me should have tested it out first. Well, fortunately I saw right away that it didn't work, so I was able to cobble together an article anyway. I just prefer to have the transcript for the interview, as well as the recording. This time I had neither! Later on, I did the training with Brandy. They say you should reward the training session by doing something, like playing with her, so we played tug of war. I was tired, so I sat on the rug with her to do that. Usually it works fine. Well, she was pretty excited. She had a new toy. When I wrestled it from her, I would throw it into the other room, so she could chase it and bring it back. Usually she doesn't bring it right back; I have to first try to grab it from her. Anyway, I noticed that she had almost torn the squeaker out, so I took it out myself. I don't want her to choke on that piece of plastic. Well, this sent her into a frenzy, so she was even more hyper than usual. So I threw the toy, and she ran to get it. In doing so, though, she jumped really hard on my foot. Ow, it really hurt. That was the end of our game. I couldn't really yell at her too much, though, as she wouldn't understand. 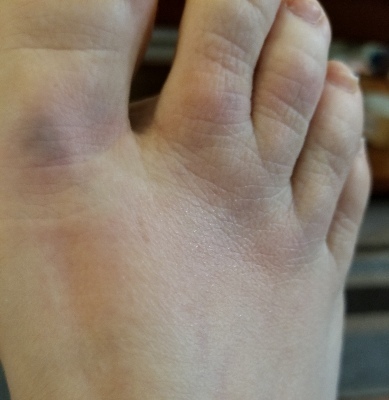 She must have landed right on a blood vessel on my big toe because it was already bruised when I went into the other room and took off my sock to look at my foot. The whole foot had red streaks and some bruising. It looked worse than it hurt. I put some ice on it. Hopefully it won't hurt too much later. After awhile, it was time to do our walk. I went ahead and made David's dinner so it would be ready when he came home. Brandy and I did our walk after that. I like to wait a little longer now so it will be cooler. Yesterday we went around 6:30 and it was still pretty hot. Thankfully, my foot didn't hurt too much on the walk. It ached a little on the way back. 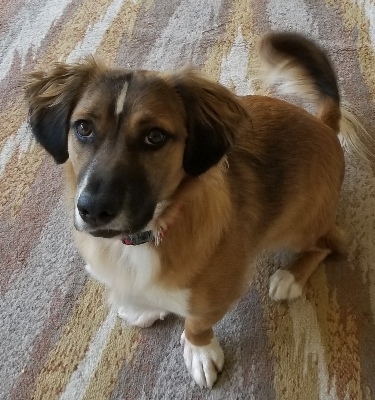 I usually give Brandy a bully stick to take with her on the walk, which helps keep her more focused, so she's not trying to chase every bird and sniff every piece of grass. When we're almost home, though, she gets tired of carrying it in her mouth and starts to drop it. If she drops it too long, I don't want to wait around. The other day she had dropped it in the tall weeds near our house, so I made her leave it. Today she was dropping it, and then we noticed that the one from the other day was lying on the ground. Someone or something had moved it out of the weeds and onto the street. She didn't want to carry either one, though. I mean, she still WANTED both sticks but didn't seem to be able to carry them very far. So I picked them up, with the Kleenex from my pocket (they were gross). Then she kept trying to grab them out of my hand, dumb dog. The things I do for the mutt! I had quite a lot of work to do today on my site, as well as last week's blog. I should have done the dishes, but I guess I'll do those tomorrow. I had to throw away my rose from Mother's Day....awww! This is why I don't like buying flowers. They don't last very long. I used to love buying them at the flower shop down the street in Honolulu, though. For one thing, I could go there every day if I wanted to. For another, they had many planted flowers, so they didn't die so soon. I tried to go to sleep early again, but I was not tired enough, and it was hot in our bedroom. I kept getting up and not being able to sleep. I was itching, too. I got up around 11:30. Too late again. As usual, I've done a terrible job of keeping up with the blog. SIGH! All I can do is promise to do better. My foot feels fine today. Thank goodness! I just feel so overwhelmed with work all the time. I thought it would be better after school let out, but now I'm just catching up on all of the things I didn't do during school time! UGH. I haven't had hardly any time to practice singing exercises, which I'm not thrilled about. Part of it, too, is not feeling well a lot. I'm trying not to eat out much, but it's hard, so I still get sick, even though I'm very careful. Well, we'll be going on vacation next week, which is great. I'm just dreading the work before and after the trip because I always have way too much to do. At least I'll be able to eat at restaurants that don't make me sick! It's been 11 years this week since my first interview with actors! That's pretty cool...time sure went by quickly! My first interview was with Lisa Edelstein, who played Cuddy on "House" on FOX. I finally went outside and brought in the bird feeder. It's been sitting out there half-full since last summer. I have no idea why the birds and squirrels didn't eat it. A lot of it was stuck in there and was hard to get out. 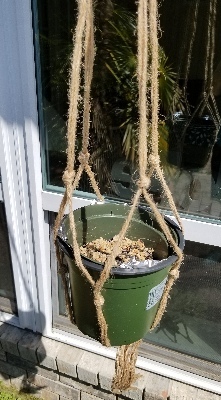 I put ithe birdseed in a hanging pot outside to see if anything will eat it... my friend Vicky on Facebook told me that birds won't eat stale birdseed. 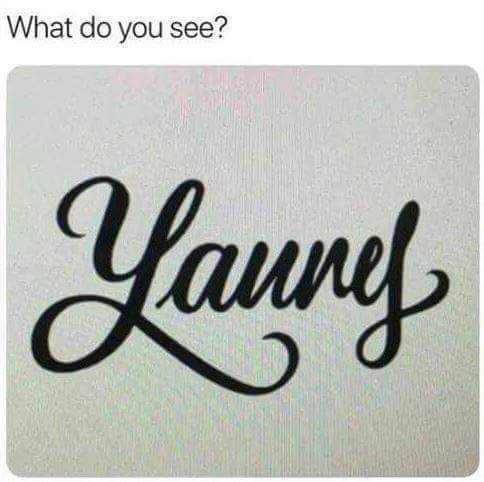 Wow, I had no idea. Picky birds! I will buy some more birdseed this weekend, so I can fill the feeder up again. We went out to dinner tonight to Antigua's. I spoke with the waiter, who had really good English, about being allergic to flour. He assured me that the food was safe. I did test it all, and it tested out as safe. I don't know, though, because I still got sick from it. Probably from cross-contamination. Unfortunately, the NIMA can only test a small portion of the food, so it doesn't tell you if some of it is contaminated or not. 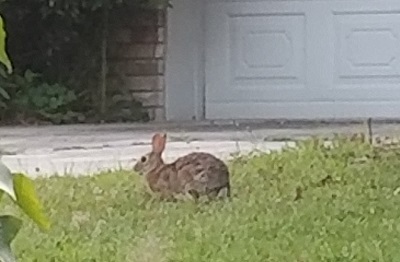 When we drove up to our house, we saw a bunny sitting on the lawn! She was right next to the driveway. I took a couple of photos from our car, but of course when I got out, she dashed off. I saw her again later that night, after I walked Brandy. David usually has Fridays off, but he had important work going on today. Fortunately he was able to come home after lunch time, so we could run some errands. We picked up my prescriptions and took the vacuum cleaner in to be repaired. The place is called Allison's Candle Shop and Vacuum Cleaners. Weird, huh? I've been making some smoothies all week. Very yummy! 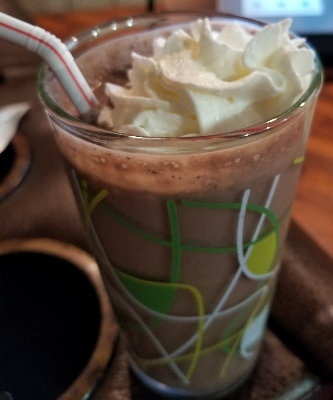 I made them with cream, Splenda, cocoa, some berries, spinach, vanilla, cinnamon and ice. I can't remember what else I did on Friday. I'm sure it was nothing very exciting. I wanted to go to the post office before it closed, but David forgot it closes at 11, not 12, so he didn't return home in time after his morning walk. We went to lunch and the store. We went to Flying Burger. I was just going to watch him eat, but it smelled too good. 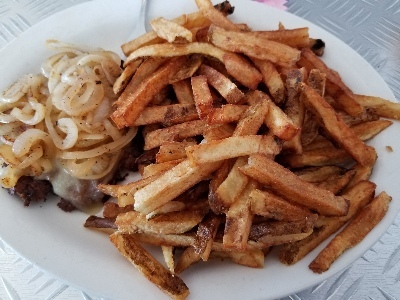 I had a burger with no bun, and fries. We only ate a few of the fries and threw the rest out. They give you way too many there, anyway. I did the usual stuff, walked the dog in the evening, cooked dinner, ate, did the laundry, worked on my site, watched TV, etc. It was really hot today. We would have liked to go to the Magnolia Blossom Festival down in the square, but the parking was probably really bad. This is a time when it would be nice to have a taxi service or Lyft. Allison's Candle and Vacuum shop called already to say the vacuum is repaired! Hopefully it won't cost much. I spent way too much time today arguing with idiots on Facebook.... I'm in this Facebook group for people with Celiac or gluten intolerance/allergy. Now, I've been gluten free (GF) for a long time. This group has a lot of people who were just diagnosed. There are way too many people on this group who assume that just because a product you buy says "gluten free" on it that it really is GF. (A lot of them are in denial) Well, that's not always the case. I know that now because I have the NIMA gluten sensor. Something was making me sick at Christmas, so I tested all of the ingredients of the Christmas cookies and eggnog to find out that the vanilla I was using was not GF. It's marked "certified gluten free," but obviously it's not. The people who developed NIMA said that when they were testing products out, they found that a full third of them that were marked GF were not. Someone posted on the group that some mac & cheese their kid that's supposed to be GF made them very sick. Well, a lot of people disagreed with her (I think she knows her own kid) and many were offering the advice that perhaps her child has allergy or sensitivity to milk or something else. Some were not very nice about it, and she felt like everyone was ganging up on her. The moderator deleted her post and maintained that if a product is marked GF, then it is GF, which is ridiculous. Sure, companies are never wrong, and they never lie. We already know that Cheerios said that many of their cereals were GF, when they weren't. They had to apologize. In the meantime, they made us sick. I was arguing with this moderator guy, and it was very annoying because he just has his mind made up. He doesn't think the NIMA works well because it's not 100% accurate. Well, that's just stupid. No test is 100% accurate. All I know is, if it tells me that a food has "gluten found," then I'm not eating it. Unfortunately, he will ruin this group. I've seen it happy SO many times with heavy-handed moderators. They end up driving everyone away. We went to lunch at KFC. I was still half-asleep and not hungry, so I just watched him eat (or rather, I played on my phone) and had a soda. Then we went to Wal-Mart to do the grocery shopping. I was sick again....Unfortunately, I know the Wal-Mart bathroom way too well! We bought a new suitcase for our trip, too. After we got home, I worked for a while, and then I was sick again, so I took a nap. I just get so tired from all of that. Sunday is always a busy day for me. I do a lot of work on my site. We went to dinner at El Compadre. They had the same steak dinner as last Sunday, so I ordered it again. I made sure to mention again to the waitress about flour and avocado. This time I had my gluten sensor with me, so I tested it. It said "gluten found." Bummer. Also, it didn't have all the nice fat that it had last time, and it didn't look like it had the same seasonings, either. Last time it had a reddish spicy seasoning. The shrimp was fine, at least, and the veggies, and the baked potato. David had some of the steak and I took the rest home for the dog. I walked Brandy after we got home. It was very hot and humid again. We went slightly later than usual, and there were quite a few people out and about, walking. Having the bully stick in her mouth is no longer making Brandy easier to control on the walk, and she seems to drop it part way, before we come home. Those things are not cheap, but I don't like picking them up with her gross dog spit all over them. For two days I've been trying to move some files to a USB drive to give to my brother. I thought it was just a really big drive, but turns out it wasn't working right. I didn't know that, and my hard drive was running low on space, so after I backed up the files again to my own external drive, I deleted them. Then I realized the files had not gone to the USB drive. So aggravating! So I had to reformat the drive and try to start over. I have to figure out which files they were again because I had to move them to the external drive. I'm having trouble finding them at all, so I'm very annoyed. Grrr! Other than that, I've just been working on my site and watching a lot of TV. It finally rained tonight, so that's great. We need rain. I don't think it's rained since last month when school was still in session. We really need it. Hopefully it will cool things off a bit, too. There was a lot of thunder. Thankfully, Brandy isn't scared of thunder. She wants to run right outside when it's raining. That's the only thing I don't like about the rain, having to try to dry her off. I'm trying to organize a karaoke night for next week at one of the karaoke room places in Kearney Mesa. Karaoke rooms are like private karaoke rooms, so you and your friends/family can sing all you want and not have to listen to strangers sing. Happy National Dog Rescue Day!